The INKOMA-bevel gear high speed screw jack type KSH is a modular design in 3 sizes. Each size is available with two ratios; 2:1 and 3:1. All gear housings are cubic in form and are machined on all faces. They are manufactured from GG 25 grey cast iron. INKOMA-bevel gear high speed screw jacks are distinguished from INKOMA-precision screw jacks HSG series by the use of spiral bevel gear sets. These bevel gears are of Klingelnberg form and are lapped together in pairs. High quality alloy steel is used in their manufacture and they are case hardened. 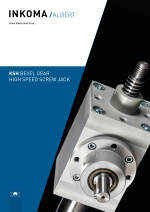 Robust rolling bearings support the input shaft and the lifting spindle axis giving a long and trouble free life. INKOMA-bevel gear high speed screw jacks provide a lifting speed of up to 30 m/min with ball screw and 13.5 m/min with trapezoidal spindle. Due to the high efficiency of the integral bevel gears a high overall efficiency is provided.(ca. 75 % for ball screw and ca. 40 % with trapezoidal spindle). For all situations INKOMA provides a comprehensive range of accessories. All drive components are compatible with one another and with a wide range of applications. INKOMA products are our own manufacture and incorporate our very high quality standards. If you have further questions please consult our local sales office or our factory engineers. We are always ready to assist with or advise about our products and their applications. Please make use of our wide experience.